The comeback is complete. 43-year-old Woods shot a 2-under 70 for one-stroke victory and his 15th major championship. It is his first green jacket at Augusta National since 2005, capping a remarkable recovery from debilitating injuries. The comeback is complete. Tiger Wood wins the Masters, his fifth Green Jacket. Tiger Woods now has his fifth Masters title. The 43-year-old Woods shot a 2-under 70 for one-stroke victory and his 15th major championship, his first since the 2008 U.S. Open, capping a remarkable recovery from debilitating injuries. 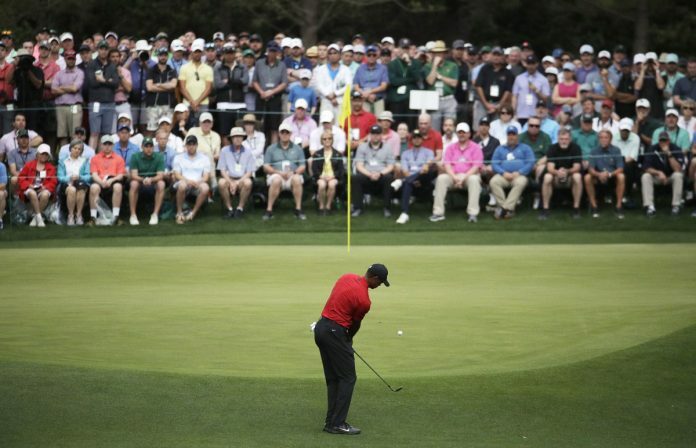 Tiger Woods’ comeback goes well beyond the two-shot deficit he erased before a delirious audience at Augusta National that watched memories turn into reality. Six players had a share of the lead at some point on the back. With the final group still in the 15th fairway, there was a five-way tie for the lead. And that’s when Woods seized control, again. Woods’ 15th major is three short of the standard set by Jack Nicklaus. It was his 81st victory on the PGA Tour, one title away from the career record held by Sam Snead. Tiger Woods’ story might top all challengers. But the eleven year drought between major championships is over for him and he has reminded the world exactly how good he was at his peak, all these years after his heyday had come and gone. Woods’ fifth Masters win makes him second behind Jack Nicklaus for the most in tournament history. Such an incredible display of mental toughness and determination to get to where he is now.